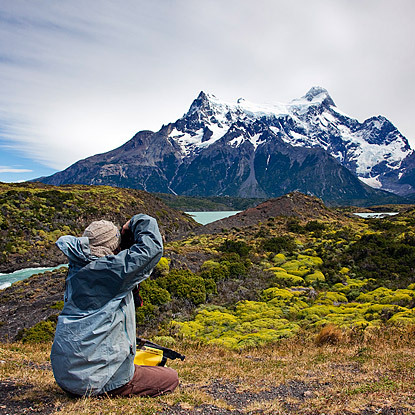 Awaken your soul in the heart of Patagonia! This 9-day immersion into deep yogic practice features dynamic yoga teachers, 2 yoga sessions daily, Yoga-Flamenco Fusion, shamanic breath and energy work, delicious organic cuisine, our beautiful riverside adventure camp, incredible heart opening adventure activities, our amazing staff of guides, and the prana of Patagonia. This is a yoga retreat like no other! As one of the premiere adventure travel companies in the world, we are delighted to offer a yoga retreat at our signature destination in Chile. The Futaleufu River is the place where we discovered and developed that magical alchemy of adventure, rivers, culture, camaraderie, and unique touches that have come to represent who we are at Bio Bio Expeditions. Blending a yoga retreat into our signature trip truly unites everything we stand for and will be your Yoga Adventure of a Lifetime! THE YOGA – We will “Awaken the Soul” through yoga practices designed to open your awareness and your energetic and physical bodies to the abundance of prana (life-force) in nature and in you. We will focus on improving our ability to be relaxed, mindful and centered with daily meditations and pranayama (breathing practices). Strengthening and stamina-building, flow-style yoga as well as gentle practices will be offered. Although attention to alignment is always given, the emphasis of our practices will be on awakening the soul and reconnecting to our essence ~ that lovely and highest aspect of ourselves that is in harmony with all of life and nature. Whether practicing on the outdoor yoga deck which is perched on a cliff overlooking the turquoise river and glacier capped peaks, or inside the golden hued “FutaFlow Yoga Loft” with huge windows letting in the views of mountains and forest, or meditating in the riverside yoga pagoda. There will be a variety of styles and levels offered for a vibrant, well-rounded retreat. To complement the yoga asana practice, there will be additional heart opening, soul awakening activities such as: guided meditation, shamanic breathing and energy practices, Native Andean-American fire ceremony, floating meditation, permaculture discussions, Yoga-Flamenco fusion classes and salsa and tango dancing. THE ADVENTURE – Working symbiotically with these spiritual practices are the amazing adventure activities we specialize in, such as: whitewater rafting and inflatable kayaking, hiking, mountain biking, horseback riding, and fly-fishing. During all of these activities you are in the skilled hands of our multi-talented, safety oriented, nurturing, and incredibly gifted guide staff. 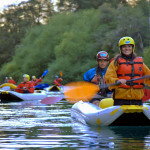 THE AMENITIES – The retreat takes place at the Bio Bio Expeditions Adventure Camp in the Futaleufu River Valley, the heart of northern Patagonia. You will wake up under a cozy down comforter to the sound of the river flowing by and a hot cup of coffee or tea will be delivered to your river-front tent bungalow. In between activities ,relax in one of two riverside hot tubs, luxuriate with a professional massage, curl up with a book in a hammock at the open-air library, or enjoy our wood fired sauna. Meals are gourmet affairs featuring organic produce from our own garden and prepared by our professional chef. Evening amenities include wine tasting at the sunset bar, salsa dancing under the Southern Cross, or just chilling out around the campfire with a cup of tea! THE TEAM – In addition to our beloved long time guide staff, we are pleased to introduce our Yoga Team. Our teachers have years of experience, hundreds of hours of training, are accomplished outdoor athletes in a variety of sports, and are fun-loving, incredibly gifted, and eager to facilitate Awakening the Soul in Chile! Eva Luna is a native of Chile, yet more so, a resident of planet Earth! She has lived, worked, and studied in Chile, the US, Canada, Costa Rica, Peru, Argentina, Spain and New Zealand. Eva has a strong yoga practice and has created a fusion of the primary Ashtanga series with basic Flamenco techniques. This fusion brings strength, flexibility and endurance to the body and stillness to the mind while connecting your inner dancer with the ongoing rhythm of the universe. Eva Luna will guide you through the fundamentals of Ashtanga yoga, sun salutations, uijayi breath, energy locks and vinyasas as well as flamenco posture, arm and hand work, balance, and four count rhythm. Eva Luna is also an accomplished gardener exploring the permaculture ethic at her two farms in rural Chile. Eva Luna is an artist, mother of two, and one of the pioneer Class 5 women whitewater kayakers in Chile. 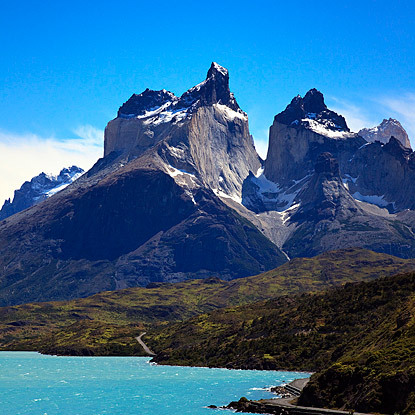 Awakening the Soul – a Yoga Retreat into the Heart of Patagonia! Below, you will get a sense of the general itinerary. There will be ample yoga sessions – morning and evening, as well as opportunities for meditation in nature during the adventure activities. The day-to-day itinerary may change depending on weather and water levels, but, everyday will feature multiple yoga sessions and outdoor adventure! Our specialty is custom-creating your adventure trip of a lifetime – if any of the activities doesn’t appeal to you, we have many others to choose from and many amazing guides to accompany you. A note on food: our professional chef can cater to any diet request or need. Please let us know your preferences and allergies and we can assure you a gourmet experience you will never forget! Arrive in Santiago, Chile. 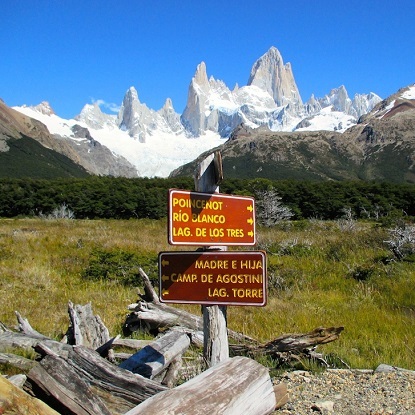 Collect your luggage, pass through Customs and then re check in for your domestic flight to Puerto Montt – gate way to Patagonia! Awaken on the banks of the Fu and enjoy your first morning in camp! One of our multi-talented guides will serve as your “tent captain” for the week and will gently wake you with a cup of hot coffee or tea. The yoga retreat will begin with a grounding, yet invigorating practice by one of our teachers. Our yoga goal for the day is to ground our energy here, at our home in Patagonia, after all the traveling, so we can set the stage for fully embracing the present moment throughout the week. Depending on weather, the yoga will take place either on the cliff-top yoga deck overlooking the river and mountains or in the “Futa-Flow Yoga Loft” our beautiful indoor space. Mornings tend to be crisp and dewy so prepare to dress warmly – a fleece is perfect. A sumptuous breakfast follows – fueling up for an active day! Today is a multi-sport day, starting with a warm-up section of rafting. We will launch our rafts from base camp after a thorough safety briefing. In a safe ‘eddy’, a short distance downstream, we’ll do a set of practice rescue drills. 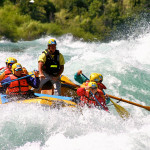 This allows the crew in each raft to hone their skills and prepare to raft as a team. We use a cataraft combined with ace safety-kayakers as part of our “safety net.” Each raft is captained by a highly trained and intuitive river guide, who guides the boat from a stern-mounted oar frame. Guiding with oars does not detract from the paddling experience. The advantage to the oar frame is greater control in pointing the bow straight through bus size holes and 15-foot high “haystack” wave trains. High siding is also an actively used “paddle” command. 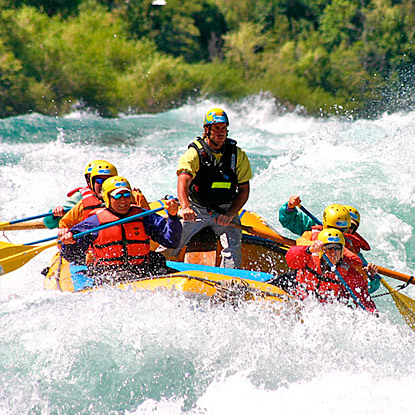 This style is consistent with any high volume, strong current river – this is the Futaleufú – one of the world’s most famous whitewater rivers! At take-out, we meet our vehicles for a 20-minute ride back to camp. When we get to camp, you can choose to go fly-fishing, take a hard shell kayaking lesson, go for a fun mountain bike ride, nap in a hammock, enjoy the sauna, have a massage, go for a hike, or soak in the hot tub. We will gather together again, in one of our yoga spaces, for “Happy Hour Yoga” to unwind after an active day of adventure. The days in January in southern Chile are very long – it isn’t dark until almost 11 pm! 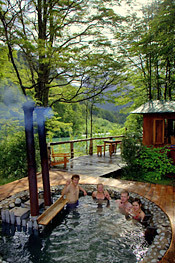 After yoga there will still be time for a hot shower or hot tub. Taking a hot shower, either indoors or under the big sky, feels very luxurious while camping in the remote wilderness of northern Patagonia! Of course, for the hardy, the river provides a cold bath and refreshing swim. While waiting for dinner to be served enjoy a glass of wine or juice at the sunset bar – an open bar always stocked with beer, wine, soda, water, and juice. Then, we gather together in the open-air kitchen/dining area, the “Galpon”, for a candlelight sit-down dinner featuring a true “farm-to-fork” dinner with organic produce from our very own garden and fresh-baked breads from the farm adjacent to our land. After dinner, enjoy the campfire and the stars before retiring to your cozy tent on your private platform. 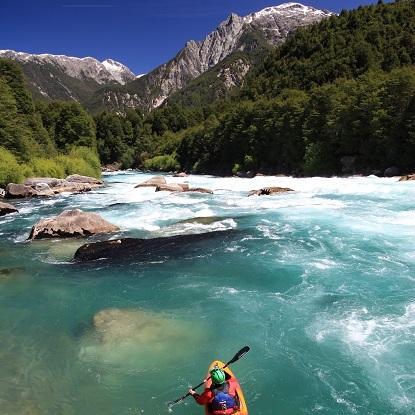 The sound of the river will lull you to sleep and send you off dreaming of the next day of adventure in Chile. We will begin the day with either a guided meditation or shamanic breathing exercise followed by an invigorating yoga practice. After breakfast, we will launch our rafts from camp and run the same section as Day 1. After we pass the Puente Futaleufú (yesterday’s take-out), we immediately round the corner to meet a big stomping continuous cascade of waves known as “Mas o Menos”, translated, “More or Less”. This is a good stepping-stone towards our first true blue class V technical rapid, “Casa de Piedra” (House of Rock) which is right around the next corner. We will get out of our rafts to scout this massive boulder choked rapid from the banks of the Fu. For those who are not interested in running this short class 5 stretch of whitewater, there is an “elegant out” to get out at the bridge, step into the bus, and drive the short distance around the two difficult rapids, getting back on the river just below them. We will stop for lunch, change into dry clothes, then prepare for the afternoon mellow float down a nice, calm 3 miles of scenic river. Often, condors soar overhead. Those who want to continue with the hard shell kayaking lesson will do so, this time on gentle moving water with abundant safety around. This calm section also offers perfect fishing opportunities. Or, you may just want to relax in the raft and enjoy the beautiful scenery. We will stop at a white sand beach, halfway down, and enjoy a yoga session on the beach, digging our toes into the sand. Upon return to camp, we will continue to celebrate the day, enjoy the hot tubs, get a massage and get ready for another fabulous dinner prepared by our jovial crew and talented chef. After dinner either enjoy the campfire with a cup of tea, or, gather in the sunset bar for a salsa dancing lesson, then practice, under the Southern Cross. If there is interest, before we paddle or ride, we will have a chance to stroll around the quaint little town of Futaleufu. There is something deeply satisfying paddling your own boat down river, knowing that your destiny is in your own hands. Of course our highly trained guides will be there to coach you, watch over you and provide safety should you need to be rescued. 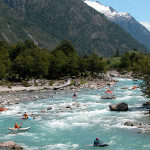 The Rio Espolon is one of the major tributaries to the Futaleufu river. We will take out at a farm that is a burgeoning permaculture center in the valley. We will get a tour of the farm, organic garden, and have a talk about permaculture by our Chilean friend and guide, Eva Luna. Happy Hour Yoga back at camp, another delicious dinner, then Eva Luna will teach us the the basics of Tango, the sensuous dance of Argentina. Awakening to the sound of the river flowing by, you know this will be another amazing day! Morning yoga will be invigorating and focus on hip openers and releasing tension in the lower back. This yoga will be essential as today is horseback riding! Surf and Turf up and down the Rio Azul valley! After breakfast we take a short drive to the stables where we will find our trusty steeds saddled up and ready for adventurous riding. After a safety briefing, we ride alongside some local expert equestrians and our own river guides who will gladly join the posse up a glorious, pristine side valley where the Rio Azul flows unhindered from its glacial headwaters. After a 3 hour ride, we stop for a picnic lunch, take a short hike to a spectacular waterfall, and then trade in our saddles for paddles to test our talents on the challenging and fun Class 3 Rio Azul, a significant step up in difficulty from the Rio Espolon. For those who want help, our river guides are happy to paddle with you, in a double ducky, making for a more relaxing ride. There are other options of coures: those who are not interested in riding horses can instead do the same trail on foot – a great hike! And, those who prefer not to “ducky” can continue back to camp by horse, by bike, by foot or by bus – the options are endless! This is your adventure vacation and we want to custom tailor it to your desires! This is a full biathlon day and you will be glad to return to camp, enjoy the soothing hot tub, a cold beer or glass of wine as you wait your turn to get a well deserved massage! After dinner we will experience a Native American/Andean fire ceremony, where we will have the opportunity to release that which no longer serves us into the flames and call forward our intentions and step more fully into our power and potential. Our rafts are the “vehicles” that allow us to access beautiful, remote sections of the Futaleufu valley. Today, we will have an early breakfast in camp then travel 25 kilometers up the road to Rio Espolon to launch our rafts for the Inferno Canyon day! Depending on water levels and how the group feels, we have the option of paddling the Inferno Canyon, a short, but intense section of Class 5 whitewater, or, we can put in just below the canyon, still allowing us to enjoy this remote, beautiful section of river, but without having to commit to the difficult whitewater. Either way, we will be practicing yoga on the river – floating meditations through the beautiful calms, and a fun, playful yoga practice on the smooth granite rock while the guides portage the boats around the un-runnable Zeta Rapid. We will be enjoying sections of the river that hardly anyone sees, taking our time to enjoy the views and the camaraderie of your raft team. In the afternoon sunshine we will blast through the “Wild Mile”, a bouncy, fun section of Class 4 whitewater that will bring a big smile to your face! Back at camp is time for happy hour yoga and some guided journaling….How has this experience begun to “awaken your soul”. What soul stirrings are you feeling, what dreams have been repressed that are starting to re-emerge? Where do you go from here? Our last full day in the Futaleufu Valley! Our morning yoga session will be the biggest heart-opening practice yet! Our teachers will guide you into an ever expanding awareness and joy. We will open our hearts to let in all the magic of the place and people, soak it in, and live it up! After being gently reminded to live presently throughout the week, we know that upon returning home, this place and this experience will be alive in our hearts forever. We will always be able to recall the sound of the river and Patagonian birds, the joy of accomplishing a good rapid or trotting through the fields on a horse, the memories of laughter with friends new and old. For those who want more river time, there is an option to raft the section just above our camp, one that we still haven’t experienced, through the class 5 rapid, Terminator. Otherwise, the options include: a scenic, moderate mountain bike ride, a beautiful hike, or, just relaxing around camp, enjoying the hot tubs or a luxurious massage. We will gather in the afternoon for a final yoga session, a mellow gratitude flow practice celebrating our week together and ending with some kirtan – joyful chanting in gratitude for all the blessings in our lives. For the evening’s festivities, our Chilean farmer friends will prepare a typical Chilean Asado — lamb roasted over a bed of coals, salad, vegetarian casserole, potatoes and farm fresh bread. We toast the river and give thanks for our safe passage. We toast the land and the people, new friends and old. Under a bright starry sky, we will spend our last night together as a group on the banks of the mighty Fu with the guides and crew. 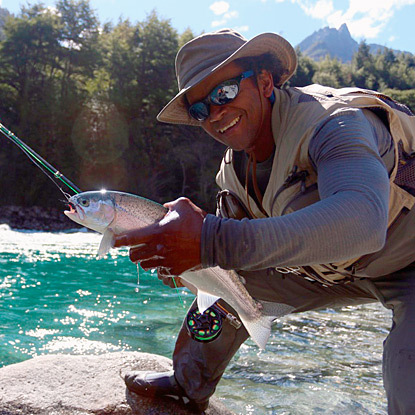 Patagonia fly fishing with a bonus! Unlike most fishing outfitters, we are able to access secret, untouched river because of our whitewater skills! Luxury basecamp with a riverside setting.